Despite our fascination with the lives of people who have been deemed societally “important” because of accomplishments, fame and riches, the nitty-gritty of how and why we know what we know about them often gets swept under the rug. Vanessa Gould’s documentary Obit, which just premiered at the Tribeca Film Festival, profiles the reporters of The New York Times’s obituary desk, using their jobs to examine how we memorialize these people, and why we’re drawn to do so. Gould and her team of primarily women didn’t spend very long filming at the Times—she says it was “just a handful of days,” emphasizing that it was far less than the length of an average documentary shoot—but they still managed to capture both the mundane and mesmerizing parts of writing obituaries as a profession. 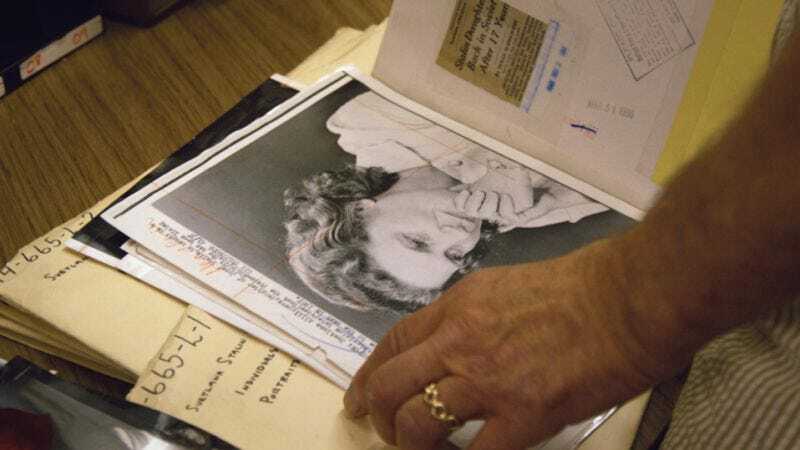 Obit’s format combines one-on-one interviews with writers and editors who work on the obituary desk, and archival footage with tours of the Times “morgue” where old articles and photos are stored, uniting the act of reporting on the deceased with the unique lives they lived. Obituaries, like all news subjects, are highly scrutinized; a few years ago the Times was lambasted, on this site and elsewhere, for describing rocket scientist Yvonne Brill in terms of her homemaking skills before her work. That’s what happens when stories are made by people, who have to grapple with the way the newsworthiness of someone 50 years ago predicates the newsworthiness of their death. After attending the premiere of the film Sunday, I spoke with Gould and Margalit Fox, one of the Times obituary writers featured (and one who has become, if not nearly as famous as the subjects of her obits, certainly renowned as a chronicler of them) at the Times Building. We discussed how the film tackled this seemingly staid topic, why only certain people get obits, and how we write about those who have died. Every bit the reporter, Fox both fact-checked herself and pushed back on my questions when they weren’t specific enough. Our conversation has been lightly edited for length and clarity. Obit is the third documentary about the Times in the past few years (it follows Bill Cunningham New York and Page One). Were you thinking about that when you made this? It’s such a big organization that at a certain point you’re not covering the same topic at all. Vanessa Gould: I think The New York Times was pretty secondary in the concept to me. I had seen those other two documentaries, but I was going after the philosophical side here—the experience that these seasoned reporters and writers could bring to the way of looking at the philosophical idea from an interesting perspective. And we went to great lengths to make sure that this didn’t look like Page One, and that it didn’t look like it was either commissioned or produced by The New York Times [laughs]. The world is hungry for The New York Times, they want to see what it looks like and stuff, so we wanted to give a little bit of that, but at the same time, remain a little bit at a distance. That means that most of the film is then fleshed out with the archival footage and stories of the people who have been written about. Gould: Yeah. We were very lean in our shooting, and pretty pointed in what we knew we needed to get and then just coming in and getting it. And when we shot in the newsroom and we followed Bruce Weber through his obit on [William P.] Wilson, when we came in, we had no idea what we were going to be doing that day. And just as Bruce got the name and it was like, okay you’re going to write about this guy, okay, we’re going to be filming Bruce writing about this guy. And I was on my phone like, okay, who’s William P. Wilson? And then we just turned the cameras on, and that’s what Bruce was doing that day and that’s what made it into the film. It was very reactionary and we just were observers. I knew that no matter who Bruce was going to be writing about—and had we been given a different writer it would have been that person—that it would be good. I knew it didn’t matter who they were going to be writing about. And in fact we were here on the day that Robin Williams died and we had left the building and missed it. I had that sort of sophomoric thing of ‘Why couldn’t we have been there?’ And then I was like, you know what? That would have been an atypical day on the New York Times obits desk and I’d rather go and get a really illustrative normal day on the desk so that people actually know what it’s really like. An unusual day maybe wouldn’t have been as uniformly telling. How did you approach about making a movie like this, where there’s very little action? Margalit Fox: A bunch of middle-aged people sitting in chairs talking on the phone and typing. We all knew that would be a potential sticking point going in and of course were aware of it from the start. Gould: Both with my last film and as well with this one, when I have been asked to write about it, I’ve often described it as the evolution of an idea rather than a narrative-based film, where you sort of start with a grain. It evolved philosophically rather than narratively. You’re referring to your film about origami, Between the Folds? Gould: Yes, exactly. Because there we started with something simple and it sort of went through this sort of math art spectrum, and it was sort of like peeling back the layers of a philosophical idea or a metaphorical idea. And when I got the idea for this film I knew it could be a similar endeavor. Everyone knows what an obituary is, and so we started with that nugget of a concept. And then we started peeling back all these different ways in which it can resonate with people. And so I think this was sort of a similar exercise, where it’s not event based, but it’s an emotional ride through something that we all think about. Fox: With origami you have those amazing visuals; with us, you don’t. Gould: This scared me a little bit about the visuals. I knew that the intellectual content could be really rich, but yes, how are we dealing with people sitting in a contemporary and therefore very sometimes uneventful newsroom, because people are no longer shouting and phones aren’t ringing and papers aren’t flying anyone, it’s just like [mimes tapping on a keyboard]. And in that case, I think we really said, okay, what do obits do? They unearth the past and they remind us of what used to be, and so the natural thing to do with that was archival. And I said from the get-go, let’s find stuff that were this film not to exist, those things might never see the light of day again. Let’s use this film as an excuse to dig through these all troves of weird stuff in the basements of affiliate libraries in Indianapolis if we can and find clues to the past that for no other reason might just be lost. Because that in a sense is what the obits are also doing. And so the archival became sort of a visual thread and a visual anchor and a way to kind of keep the film engaging on that level. And we tried to edit the archival in really different cadences and really different styles. It rhythmically has a really interesting tone that I haven’t seen before. Gould: Yeah, that was done very intentionally. Because each archival [piece] was about a different story and a different person obviously. But we took that obvious concept to the most visual manifestation that we could. The Manson Whitlock typewriter sequence was fashioned off of La Jetée by Chris Marker and using stills and this staccato fashion to tell a story about a person. In other cases, we played around with stuff; [for the sequence about John] Fairfax, we tried to cut that into an edgy way of a man crossing the sea and seeing his girlfriend on the shore at the other side. So we really tried to tap into the people. There are hundreds of thousands of obits that you could have covered. How do you even begin to think about who to tackle? Fox: And we’re talking well over a thousand pieces from any of us. It still blows my mind to think of how many obits you read. Gould: So I went into these interviews with my wish list. But as soon as I started talking to the writers I kind of discovered that the best way to start curating these stories was to see which ones the writers remembered writing. Because it’s very difficult, I’m sure you can imagine, for them to... the steep learning curve that then the next day they have to completely shed in order to kind of get the next one going. And as Margo will tell you, it’s very difficult to remember the names, much less the details. So if somebody stuck in their craw, that was a pretty good clue to me that this was a worthy endeavors. And that was step one. Step two of the curating, which sort of did its own work, was with our archivist. I would say we had a broad stable of starters. And then the archivist went out and started doing research and where we found the most compelling and really rare and unseen archives we then sort of went with those. So it wasn’t necessarily a decision that we made but rather let the work do itself. The reason I got into journalism was because I always got bored with other jobs eventually; with this one, I can learn new things every day. That’s even more true with obits; you don’t have a beat—as you said, you start over every day. Fox: All journalism is enfranchised dilettantism, but nowhere more so than in obits, where as we say in the film, you can be writing about exotic chickens one day and underwater cartography the next. “Instant expert” one of my colleagues used to call it, and that’s exactly right. Vanessa, you got interested in doing the film because Margo called you to ask questions about an obit, right? Gould: Yes, I sent them the biography of an artist that had died, and Margo was assigned. He was an unknown artist who lived in the suburbs of Paris, and here The New York Times is covering him. Fox at the premiere of Obit. How do things get assigned? Just this person’s free, or this person would do a good job? Fox: It’s both of those things at once. There are only, I think, five of us staff writers who are paid to write obits full time, so we are all in principal paid to be generalists, come off the bench and do the exotic chickens, do the underwater cartography, do the Supreme Court Justice, and we’ve all done plenty of things in subject areas we know nothing about. I would say 90 percent of my job and that of my colleagues is playing instant expert. That said, if we are free and someone comes along who has worked in a subject area that one of us happens to know, of course it’s in the editor’s interest and in the paper’s interest and our interest as a writer to be given that assignment. For instance, my background is in classic music and linguistics, so the dead classical musicians they are inclined to give to me because I don’t have to do quite so much homework as I would if I were assigned to write about a rock musician. But in any given week I might have to do any one of those things. You touch on this in the film that not a ton of papers have obit desks left. How many papers do? Fox: Our section head Bill McDonald will probably be best positioned to answer that, but very few, including at big papers. My understanding is The Washington Post severely curtailed the purview of their obits section a couple of years ago where they were just going to do in the print paper local obits. Now to them of course a local obit could be a Supreme Court Justice, but it’s also the little lady from Silver Spring, Maryland who made homemade jelly, so it’s a kind of odd mix of the very lofty and very local in the print paper. And then on their blog, which has the wonderful name “Post Mortem,” they do the stuff that doesn’t make it in the print paper. The LA Times even more recently apparently let go most if not all of their robust staff --please backstop me on that, I’m doing this from memory—so we’re kind of the last ones standing. And it’s very painful in terms of what’s happening to this beat that we cherish. How have sites like TMZ shifted the way you approach writing obits, if at all? Fox: We’re representing two ends of the telescope, and both are important. It’s not the sites per se, it’s the existence of the web, and the existence of nytimes.com means we now have a continuous news cycle. “Our Lady of Perpetual News,” one of my editors used to call it. And so indeed the editors—and again, Bill McDonald or Jack Kaddan would be the person to talk to—they monitor all those sites and so they may get a prompt of news of a death from a site like TMZ, but also from the websites of Associated Press, Reuters, the traditional wire services, just in this new electronic form. That’s how we very often first learn of a death. Not the only way, but very often. We are then obliged, as we discuss in the film, to confirm it independently so we don’t kill off someone who’s not dead. And then the rapacious demands of the web mean we are no longer writing for the next day’s paper, we’re writing to get a very newsworthy person onto the web as soon as possible, in a manner of minutes ideally. With blogs, other writers are able to aggregate and pull together their own obits from your work, YouTube clips, etc. Do you think about how people are consuming the pieces you do and the archival stuff that’s out there? Fox: When you’re under the gun and writing on deadline, the farthest thing from your mind is sort of meta socio-historic stuff. The order of triage is, confirm the death, speed read the clips, write the piece that’s as engaging as you can, fact check the hell out of it, get it edited, copy edited and onto the web. I can’t speak for my colleagues but the farthest thing from my mind is how people are independently consuming or curating our stuff. I think there’s a conception that reporters are somewhat mercenary, that they’re not always nice to their subjects. And I think what was addressed in the film was how obits is one of the beats you particularly have to be careful in walking that line between being respectful but also getting questions answered. Fox: I’m a little hung up on the word mercenary. Mercenary means we’re after money. We’re all after money in the sense that we want to get our paychecks, but I’m not sure how that pertains in this sense. I mean you’re out for the story above the feelings of people, which by the way, I don’t have an issue with. Fox: Look, we’re human, we’re all good people, we don’t want to trample roughshod on a bereaved family—that would be unconscionable. As I say in the film, we have to make it very clear to the families that we’re not their advocates, we’re not a mouthpiece, we’re not writing a fuzzy, feel-good puff piece, we’re not grief counselors, we’re not their friends, we’re journalists and these are news stories. They’re basically profiles, reported and written, warts and all, like any other story in the paper. That said, you are getting people at a usually really terrible time in their lives. Someone they love has just died, they’re bereaved, they’re exhausted, they’re grief-stricken. It behooves you both as a journalist to get your source comfortable with you, and in purely human terms, to treat families as well as you can within reasonable professional limits. Every once in awhile you’ll get a family, particularly families of people that have been in public life all their lives, they’re used to spinning the media, they’re used to wielding power, who will try to stage manage the story and say, “We want you to put this and leave that out” and you literally have to tell them—once a year, maybe, I’ll have to read a family the riot act and say, “We do our own reporting and we can no more allow a family to control the discourse than a White House reporter can allow the government to control the discourse.” And occasionally I will say—if I feel that is not understood—then there will be no obit. Now that’s a bluff, I know they’re never going to call me on it because they want an obit in The New York Times desperately. No one’s ever called me on that. Our now-retired colleague Dennis Hevesi is the sweetest guy in the world, but he was also a good solid newsman with 40 years’ experience. He said the best thing I’ve ever heard anyone say to a family: he was writing about some disgraced politician and he said to the family—very gently, but also very firmly—“You know, I will have to have a paragraph in there about the four months your dad spent in jail.” And either the family can accept that or they couldn’t, but he prepared them. This is a news story. It’s not one of these warm and fuzzy eulogies that you still see passing for obits sometimes in small-town papers where everyone who died in that community was, by some miracle, a saint. We will occasionally get families of people who haven’t been in the press that much their whole lives who say, “Please put that he touched the lives of everyone he ever knew, please put he died doing what he loved, he died surrounded by his family,” and we just kind of silently roll our eyes because we know that stuff is going to go right on the cutting room floor. It has no place in a news obit. It was nice to see it put out there why you don’t use terms like passed away, you always say died. That’s something that I try to remind our writers, who aren’t trained obit reporters: This is not a friend you’re talking about, or a family member—this is a news piece, however casual it is. We’re not cushioning it for our audience. Fox: Died is died is died. There’s really no other way to say it in a news story. Often now you’ll see in papers “He transitioned” or “He made his transition” and the first time someone said that to me about 10 years ago I thought, well, I pretty much figured out this is probably a euphemism for died, but I have to make sure, what if transitioned means they’re in a coma but they’re still hanging on? And so I kept asking, ‘Did he die? Did he die?’ And my source kept saying, “He transitioned, he transitioned.” The source just couldn’t bring herself to say this word died, and so I finally had to, with my heart ever-so-slightly in my mouth, put “the source confirmed the death.” And sure enough, transitioned equals died. Lastly, what was really interesting to see you explain was how in the time you’ve been writing obits, the people that you’re writing about have shifted i.e. now there are fewer white men. Do you remember when you first started noticing that? Fox: I started full time in obits in 2004 and my conceit that I talk about in the film is that because obits are inherently retrospective, it’s the most retrospective genre in the paper, we’re looking at the people who made the world. By the time we get them they’re in their 80s and 90s, sometimes over 100, and so by and large they made the world when they were in their prime, 40s, 50s, 60s, so that retrospective window generally overlooks a period in history that’s maybe 40 or 50 years in the past. And so indeed my first couple of years I found myself typing the Cold War, the Cold War, the Cold War over and over again. This was 2004, and I was writing by and large about people who made the world, for good or ill, in the 1950s, overwhelmingly white men. And so every couple of years that window edges up and so by the time we get to the late 1950s, ‘60s, we’re into the Civil Rights movement and so therefore people of color start appearing with more frequency on our pages because those were the people who were allowed or who bravely made themselves entitled to shape the world in that era. And then again edging still farther we get into the women’s movement. I happened to have the great privilege of writing Betty Friedan’s obit—again it was one where we should have had an advance, I’d probably been assigned it, hadn’t gotten around to it—and she died, and so I remember it was on a Saturday, I raced down to the newsroom, wrote 2500 words on deadline. It’s exactly what you don’t want to get caught doing, but your training allows you to do it. And I do remember in that one meta detached corner of my mind—and maybe this answers your question I couldn’t answer before, about the meta considerations—I do remember writing it under intense pressure thinking, “My god, if it weren’t for this woman, I, a woman in the 21st century, would very likely not have the privilege of writing a page one article with a byline for The New York Times.” So that I found very moving and it had a wonderful kind of circularity to it. Images via Tribeca Film Festival and Getty.